Locked in a pitchers' duel, it was the Cardinals who blinked first. 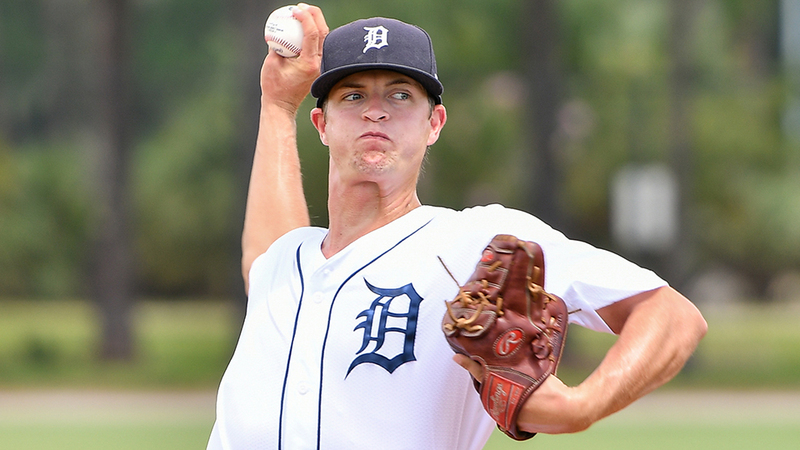 Game 1 of the best-of-3 Gulf Coast League Championship Series featured a total of six hits and 15 strikeouts before Tigers West scored on an error in the bottom of the ninth inning for a 1-0 win over the Cardinals on Monday afternoon. Tigers starter Garrett Hill scattered three hits and a pair of walks while fanning five over 5 2/3 frames. The 22-year-old righty retired the first seven batters he faced before issuing a walk to Mateo Gil in the third. "That's what Garrett has been doing all season," said Tigers West pitching coach Santiago Garrido. "He locates his fastball in the bottom of the zone, and he's going to attack hitters and force contact." Hill sat down the next three hitters before plunking Jhon Torres and then yielding a single to Carlos Soto. The San Diego State product retired five of the next six Cardinals to step to the plate and, after allowing a leadoff single to Josh Shaw in the sixth, induced a flyout to center by Torres. Carlos Soto snuck a ground ball through the right side of the infield to set up the Cards with runners on the corners and one out, but Shaw was thrown out at home trying to score on a passed ball. Cardinals hurler Connor Coward matched zeros with Hill and even outlasted him. The 22-year-old allowed three hits and a walk with five punchouts over seven innings. He faced one above the minimum over the first three frames -- a two-out walk to Justin Childers in the third being the only blemish. The right-hander worked around a hit-by-pitch and a single to right from Hector Martinez to lead off the fourth, sitting down the next three in a row. He finished his outing by retiring seven of the final eight hitters he faced. With two outs in the ninth, Tigers left fielder Vinny Esposito worked a walk against Chris Rivera (0-1) and promptly stole second with Pedro Hurtado at the plate. A ball-four wild pitch sent Esposito to third, and a throwing error by catcher Ivan Herrera allowed Esposito to score the winning run. Jake Baker recorded the final out of the fifth for Tigers West, and Angel De Jesus (1-0) added three perfect frames with three whiffs. "Baker is a left-hander with a great curveball. We needed him to get the lefty hitter there and he did his job," Garrido said. "And then De Jesus was just unbelievable. He's been a starter all year, so to come out of the bullpen and retire nine in a row was huge. He's got a fastball that's 93-96 [mph] and just went right at guys with it and he was successful." Game 2 will be Tuesday, Aug. 28 at the Cardinals Complex. First pitch is set for 12 p.m ET. "It's a great moment for these guys. Not many players get to go through this," Garrido said. "I think tomorrow is going to be great. All the hard work we've put in all year, the dedication to each other, this is exciting for everyone. They know what's at stake, and they all want it."